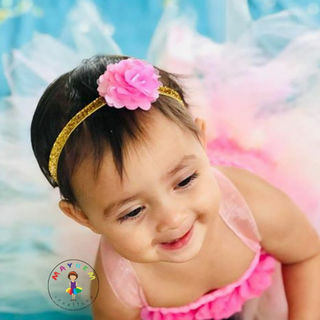 Hand tied tutus and tutu dresses from Auckland’s favourite tutu maker are exceptionally popular with little princesses from around New Zealand! 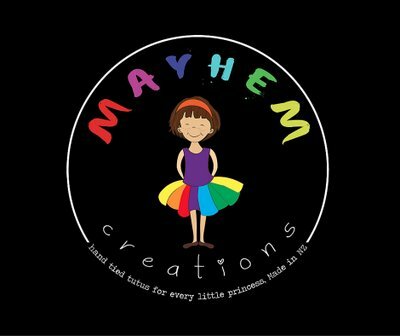 No matter what type, size or colour tutu you are looking for, Mayhem Creations are your ultimate online tutu store! All of our tutus are made when you order, specifically to your requested size and colour. Hair bows, hair ties or headbands - we have lots of options that will suit your tutu perfectly! Check out the options below. This stunning headband is a gorgeous sparkly gold thin band, and lovely pink flower. A perfect match to our Ballerina Rose tutu. We can match a headband to any tutu - just let us know what colours you prefer or let us surprise you! Flowers may vary depending on current stock levels. These cute little headbands make a gorgeous addition to any outfit and are a very affordable price. Are you seaching for the perfect addition to a rainbow tutu? This very cool headband is the answer. The design of the band will depend on current stock levels so please check before you order, if you require a specific design or style. 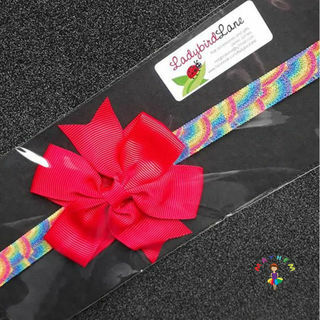 Each bow can be done in any colour to match your rainbow design or tutu. These cute headbands will make a special addition to any unicorn outfit but especially a Mayhem tutu! There are currently two colour options either purple or blue. These gorgeous Pinwheel Bows will add the finishing touch to your girls outfit! Measuring 8cm across, each clip has a non-slip silicon grip so they won't fall out - even in really fine hair. Please note that although everything has been done to accurately capture the colours, colours can vary slightly depending on the device you are using. Tutu skirts are a dream come true for every wannabe princess, dancer and party girl! Here at Mayhem Creations, we live and breathe everything tutu related. There is no tutu we can’t make and no tutu you can’t order! No matter what type, size or colour tutu you are looking for, we’re your ultimate online tutu store! All our tutus are made when you order, specifically to your requested size and colour then sent to your home within 2-3 working days. Even better, delivery of your tutu skirt is free too (for non rural addresses)! Our layered skirt tutus are ideal for wearing to a wedding or birthday party. If you are looking for something plainer, our single demi tutu skirts are perfect for the dress-up box! Try our tutu tails for an older tween or a little princess who wants a tutu but finds it hard to wear one of our full skirt versions. Custom made upon order for sizes 6 months to 7 years and up, our tutu skirts are an extremely popular gift and are perfect for every little girl’s daily wardrobe! We know that everyone has favourite colours. We love every colour and our range of tutus show this! We’re always creating fresh new tutu colour schemes for our customers, but your favourite is missing, we’ll make it just for you at no extra charge. We also handmake tutu table skirts, tutu cake skirts and dolly tutus too. Take a scroll down and experience the magic which is Mayhem Creations! Not found what you are looking for? We will customise any tutu - just send us an enquiry.